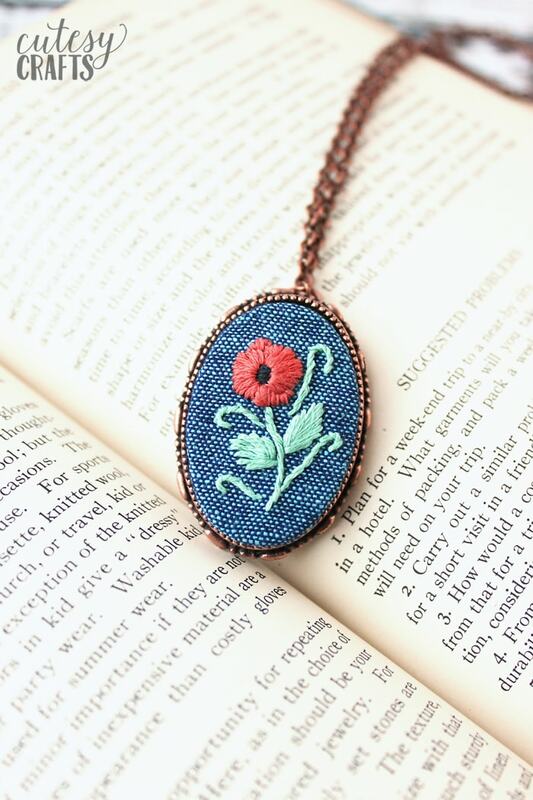 A friend of mine showed me a beautiful embroidered necklace that she owns, and I knew I had to try making one. 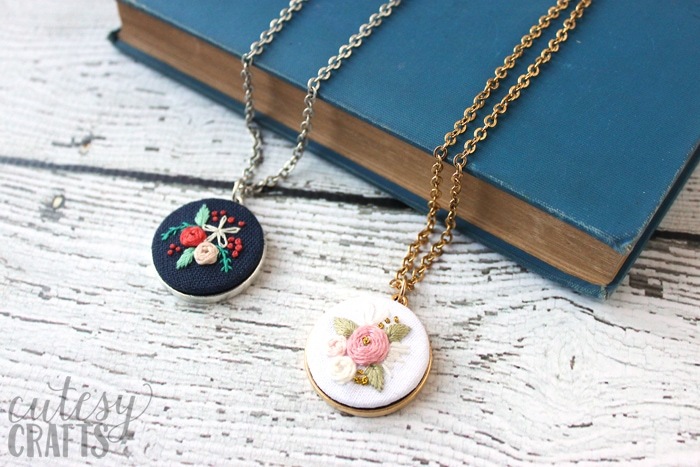 Well, I couldn’t stop at just one, so I have a whole slough of free hand embroidery necklace patterns to share with you today! I’m so excited to show them off! If you need help with any of the stitches, I have video guides on my embroidery stitches guide page. The necklaces turned out so beautiful! 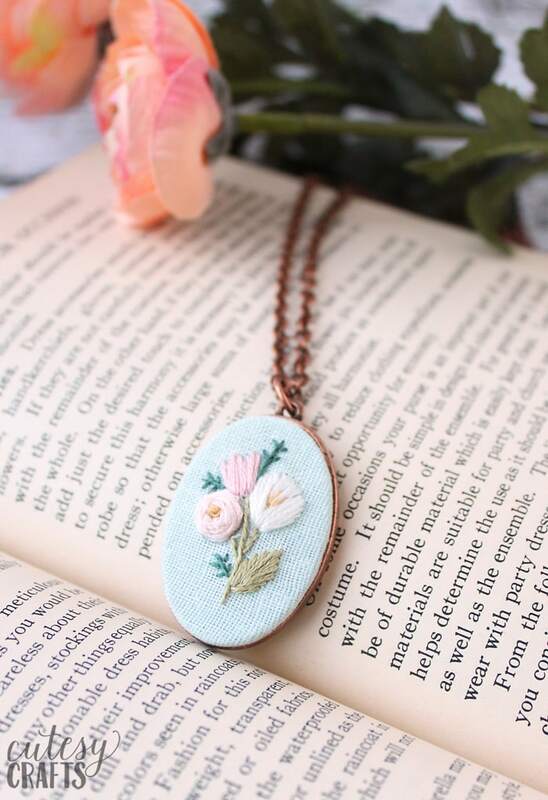 It was pretty difficult for me to find high quality jewelry that would work for embroidery, but I finally hunted some down. 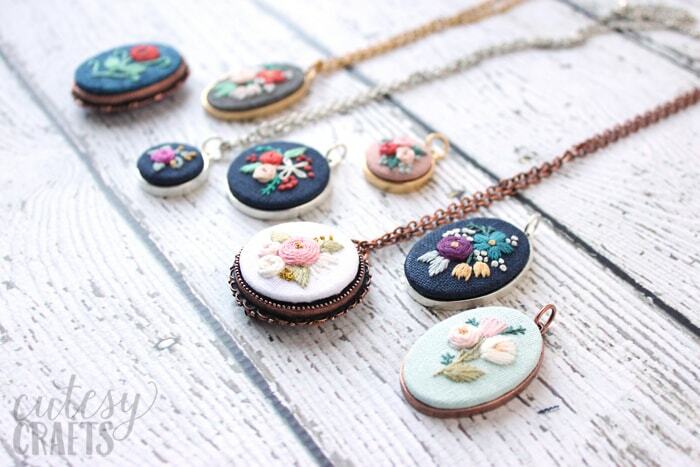 Each embroidery pendant frame has a metal insert that fits perfectly inside, and the more ornate ones can be an embroidered necklace or broach. To make things easier for all of you, I decided to stock these pendants in my Etsy shop. I’m so excited to be able to offer them to you! 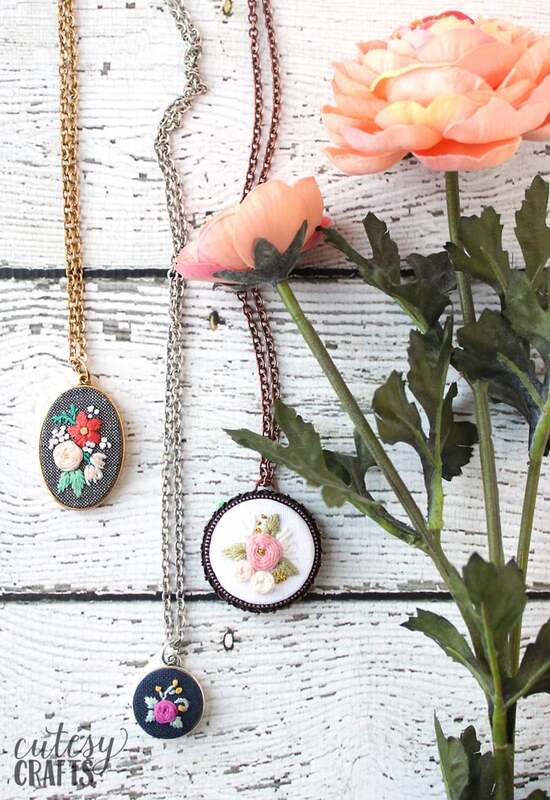 The finished necklaces make beautiful gifts! 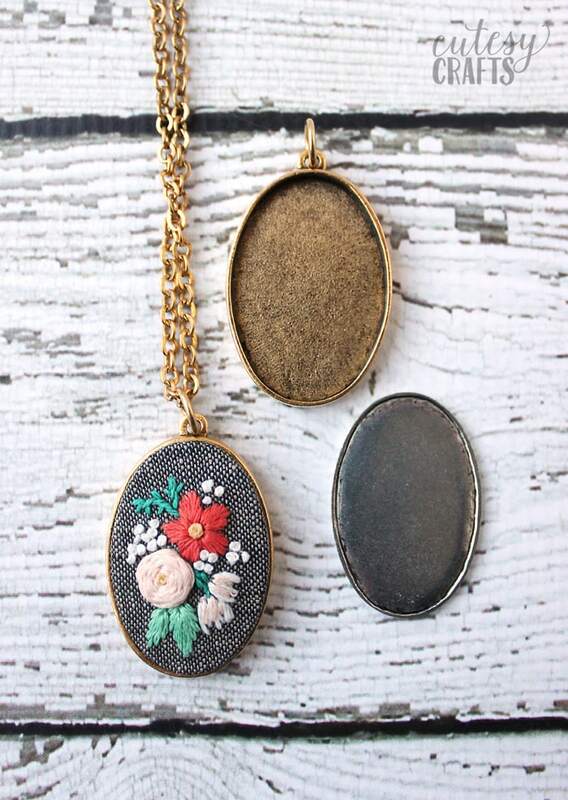 embroidery pendant frame – Get them in my Etsy shop here. strong glue – I use this one. fabric protector spray – This is the one I used. I wrote up an entire tutorial and filmed a little video that will show you how to assemble the necklaces. 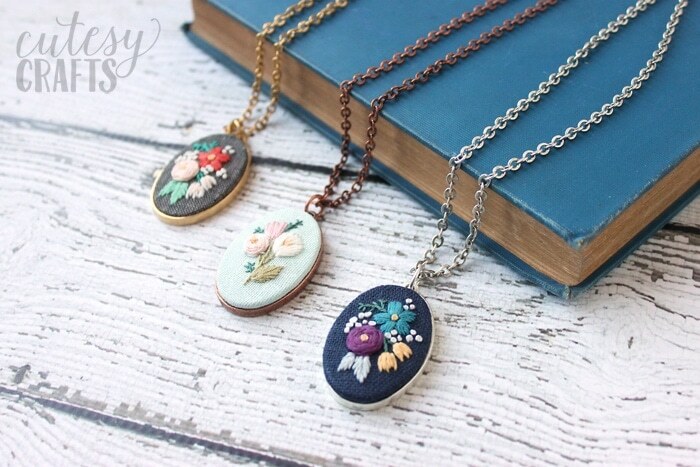 Find that on the post about my embroidery pendants and how to put embroidery in a necklace. 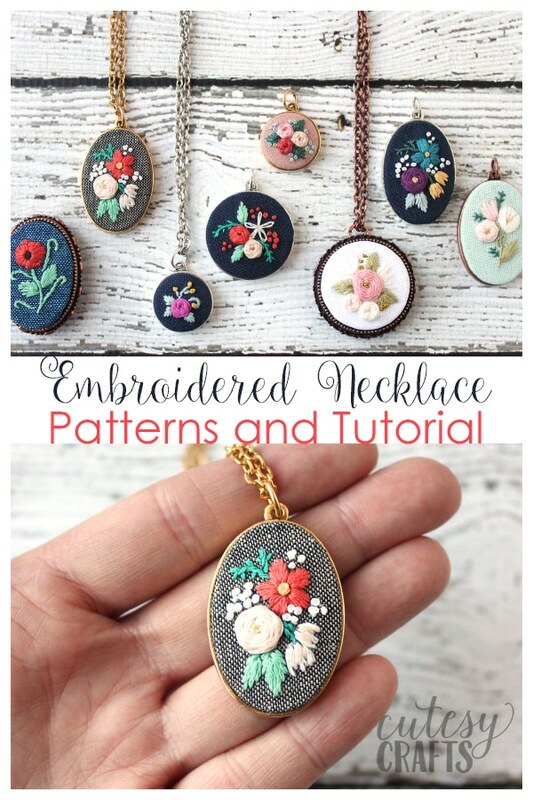 Feel free to change the colors in any of my embroidery necklace patterns. I’d love to see some fun color combos for fall! I added a little gold thread in the one with the gold chain. It’s hard to work with, but can be very pretty! This is one of the more ornate settings that can be an embroidered broach or necklace. The copper color is so pretty! Which one is your favorite? I’d love to know! To download this free hand embroidery pattern, enter your information in the form below or click here to subscribe to my newsletter. It’s free, and I’ll keep your email address safe. You can also unsubscribe at any time. Make sure to check out my other hand embroidery designs. I’ve got lots of free embroidery patterns! I absolutely adore all of these! They are quickly becoming my new favorite thing to stitch. Thank you so much for sharing the patterns. I made one as a gift and it’s so gorgeous, she’s going to love it! Oh, that makes me so happy to hear! Aren’t they fun?! So quick and easy. I hope she likes the necklace! Love these. So soft and pretty. Very interesting and beautiful craft idea.thanks for sharing the idea. Gorgeous. 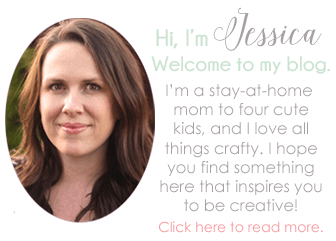 When will you have more of the frames in your Etsy shop? Thank you! Someone just cleaned out the last of them. I have an order in, but it’s delayed due to the manufacturer’s holiday schedule. They should be back in stock in my shop in 2-3 days. 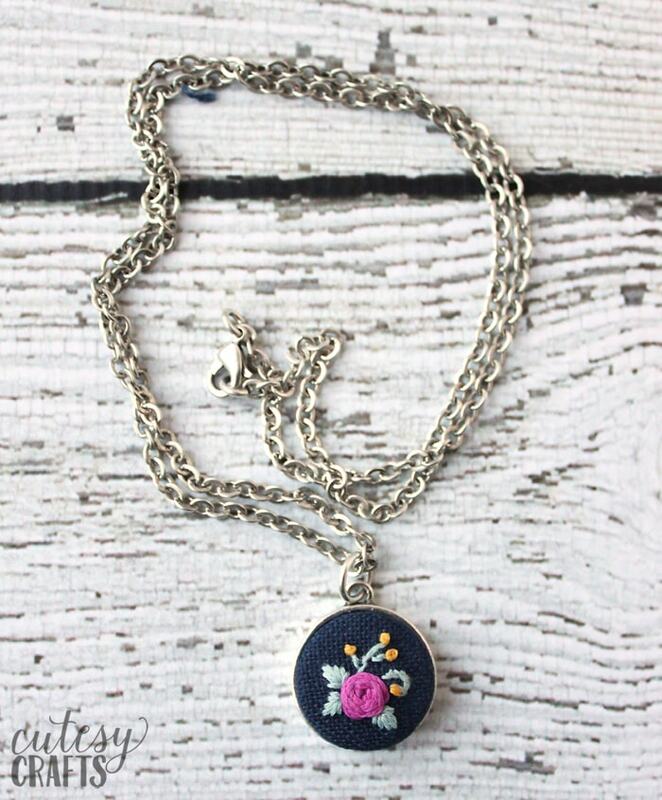 The necklaces are beautiful and so unique! I just wanted to say thank you for posting free patterns. It’s so kind and generous of you. 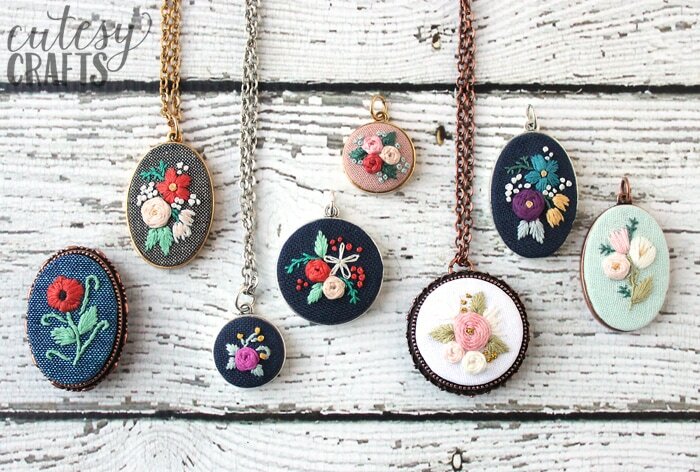 The embroidered pendants are my favorite! You do beautiful work. Thank you! I’m so glad you like them!